Nature’s bounty provides us with a galaxy of things that we can use to beautify ourselves. For thousands of years, Indian women have been aware of this and have made the most of them for their beauty routines. Grandmother’s Pandora’s Box of beauty tricks consisted of many natural ingredients which are commonly available. 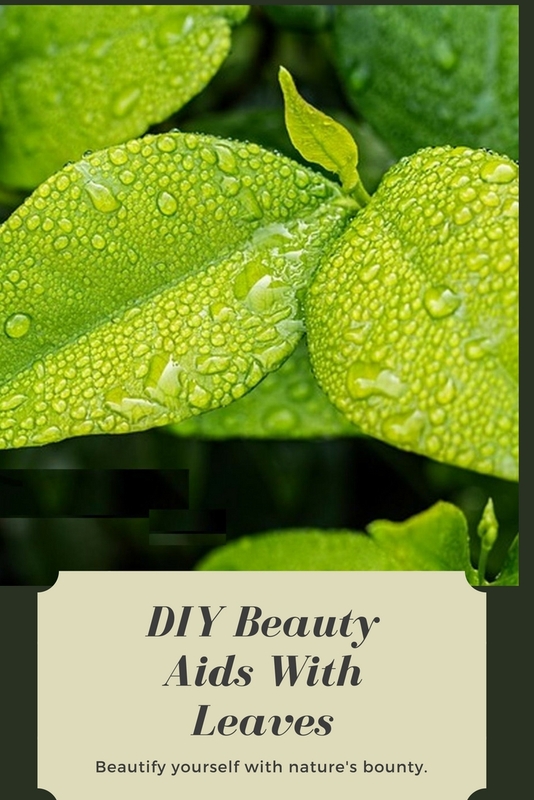 While fruits, flowers and vegetables are often used in different beauty recipes, leaves are also invaluable as beauty aids. These include mostly leaves of mint, lemon, tulsi, henna, neem, drumsticks, lettuce etc. This is a very well-known remedy. If you have pimples and blemishes, grind a few mint leaves to a smooth paste and smear it on your face a few hours before going to bed. Then rinse it off; the marks left by pimples will face away gradually. Besides this you can even try this mint sugar sole softner and pamper your feet. Do check out some more uses of mint here. Neem leaves are terrific in treating skin disorders. Neem, as we all know, has strong antiseptic properties. Neem leaves should be put in bath water, especially during monsoons to ward off any skin infection. Those recovering from chicken pox, eczema or other skin ailments will also benefit by the above method. To lighten unsightly blemishes and scars on your body, boil a handful of fresh neem leaves in a bucket of water till the water is reduced to three-quarters of its original quantity. Cool and strain it and use it for your bath. In a week the scars will not only become lighter and less ugly, but there will be considerable improvement in your skin condition. Neem is also an excellent astringent and is good for oily skin. Boil one cup of neem leaves for around 15-20 minutes. Cool and strain. Leave in the fridge and dab on the face after washing it. It’s believed that if you smear a paste made of tulsi leaves (Tulsi powder) on your body once in a while, you will keep skin diseases at bay. Lice flee at the sight and smell of tulsi leaves. Apply Tulsi (Basil) leaf juice liberally on the head at night, and wash it with shikakai the next morning to get rid of lice. Do this a few times. Henna has been used for centuries by Indian women to color their hair and to decorate their hands and feet. Fresh henna leaves are ground to a paste and used. You can even use henna powder if henna leaves are not available. Apart from coloring the hair, henna is also an excellent conditioner. Half a cup of henna powder can be combined with one egg, a tsp of coffee powder, juice of 1 lemon and a quarter cup of curd. This mixture should be applied and left on the hair for 45 minutes and then shampooed off. It leaves the hair shining, easy to manage and full of bounce. Another well-known folk treatment for falling and gray hair: Soak a few amla (Indian Gooseberry) in a little milk for a couple of hours. Drain and grind to a smooth paste along with a handful of henna leaves. Mix well and rub into roots of the hair an hour before shampooing. This will help prevent hair-fall to certain extent and also make it dark. Henna is also useful in the treatment of hair-fall, dandruff and premature graying. Mustard oil (Sarson ka tel) boiled in with henna leaves promote healthy growth of hair. About 60 gm of henna leaves should be boiled in this oil, filtered through a cloth and stored in a bottle. The paste of henna leaves boiled in coconut oil can be used as a hair dye to blacken gray hair. The paste itself can be applied to the hair and washed away after a few hours. Apart from its use in salads, lettuce leaves can be used as a beauty aid. If you have a greasy skin, grind a lettuce leaf with a small rose and mix a few drops of lemon juice. Apply the paste to your face for half an hour, then rinse with water. The greasiness will disappear for the day. Leaves of the sour lime or lemon can be sprinkled in bath water for added freshness. Make a paste of the tender leaves of the lime tree and mix with a pinch of haldi (turmeric). (Buy turmeric) Apply on the face and allow it to remain for a while. Wash off with warm water. It softens and lightens the skin and gets rid of stubborn blemishes. The use of bay leaf or tej patta need be restricted to the kitchen. Bay leaf is called as Pulao yele in Kannada, Tamal Patra in Marathi and Gujarati. This is effective in cleaning teeth also. Rub your teeth twice a week with a dried bay leaf and you will have sparkling teeth. If you want your hair to be long and lustrous, try this. Boil 2 or 3 handfuls of celery leaves in water. Remove from fire and set aside to cool. Then strain out the water and add the juice of a lemon to it. After washing your hair, rinse it with this water. Apart from its use as a vegetable and in salads, cabbage can be used for treating dry skin. Grind a few cabbage leaves and extract the juice. Dissolve a little yeast in it and add a tsp of honey. Mix well and apply thickly on face and neck and leave for 15 minutes. Then remove with cottonwool soaked in water. This pack also counteracts wrinkles. You can also try a cabbage juice facial in winter: Extract the juice from a few tender leaves, pat into skin and allow it to dry and remain as long as possible. It’s a fine skin toner, brings luster to the skin and produces a youthful, fresh appearance. Used, strained tea leaves are effective in preventing hair from falling. Take about 6 cups of strained tea and wash your hair with it after shampooing. Then rinse with plenty of water. It also makes the hair glossy and soft. Tea leaves can also be enveloped in a piece of muslin and put on closed eye-lids to counteract eye strain or tired eyes. These can be crushed to a moist pulp and applied directly to heal outbreaks on the skin. Marigold petals are also used as a wash for oily complexions. This herb is a versatile beauty aid. It possesses the ability to control acne, soothe skin irritations and cleanse the skin from blemishes. An infusion of leaves and flowers of this plant, fresh or dried, can be used beneficially for these purposes. Have a look at this Chamomile mask and Apple mask also. For removing dandruff, grind the leaves of the hibiscus (jaswand) plant into a paste and apply on the scalp. Let it remain for some time before washing it off. Also take a look at this hibiscus based hair oil, which helps deal with premature graying. Drumstick leaves face packs can help you with acne and also impart glowing skin. Application of drumstick leaves hair pack helps with dandruff also. Read more about it in Skincare and beauty with Drumsticks (Moringa Oleifera).Also go though some medicinal uses of drumstick leaves. Malabar Spinach leaves / Basale Soppu heals boils, scabies and provides relief in mouth ulcers and prickly heat rashes. Read more about it in Malabar Spinach - 9 health benefits & home remedies. Interesting post! I read the tip about the leaves in magazine, tried it, and it works for me as well! The juice of a watermelon can be used for skin blemishes. Grate and squeeze the juice from a small watermelon. Apply to your face and neck for fifteen minutes. Wash with hot water and follow with a splash of cold water. In measles etc. the patient is laid on neem leaves. Neem leaves in bath water and fanning the sick persons with branches is common . All parts are used for application in skin diseases. I use aloe vera in most of my beauty care recipes as this plant is great for healing. Choose aloe vera leaves that are large and mature, but still soft and succulent with plenty of moisture and gel inside.Cut the leave, peel one side of the leaf, so that you will have access to the gel. Use a tea spoon to transfer the gel to a sterilized can. Add a few drops of grapefruit extract to help with preservation. Always keep the fresh aloe vera gel inside the fridge. Guavas have high astringent properties, and guava leaves rank even higher. Apply a decoction of the leaves on your skin to help tone and tighten facial muscles. Guava leaves can be boiled and massaged onto the scalp. Guava is rich in antioxidants that could do wonders for volume of hair.